Here At This Table Come and be filled here at this table. 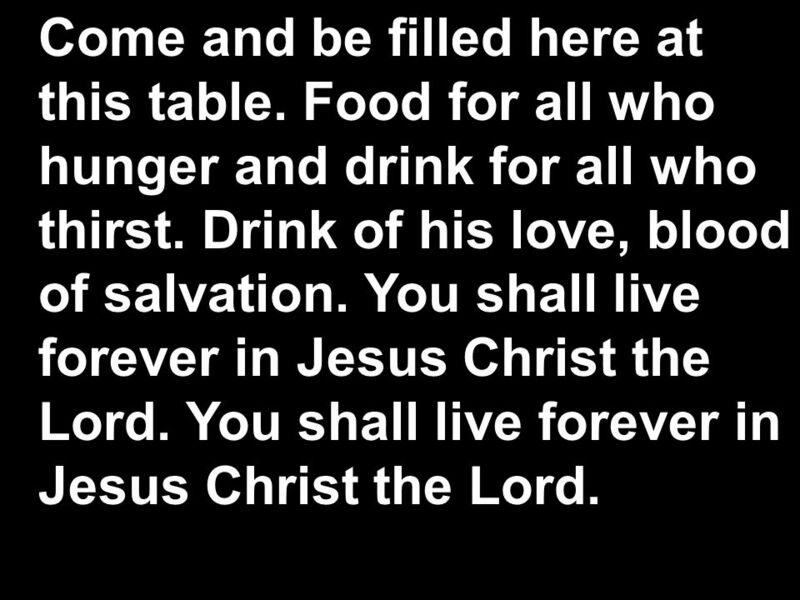 Food for all who hunger and drink for all who thirst. Drink of his love, blood of salvation. 1 Here At This Table Come and be filled here at this table. Food for all who hunger and drink for all who thirst. Drink of his love, blood of salvation. You shall live forever in Jesus Christ the Lord. 2 1. 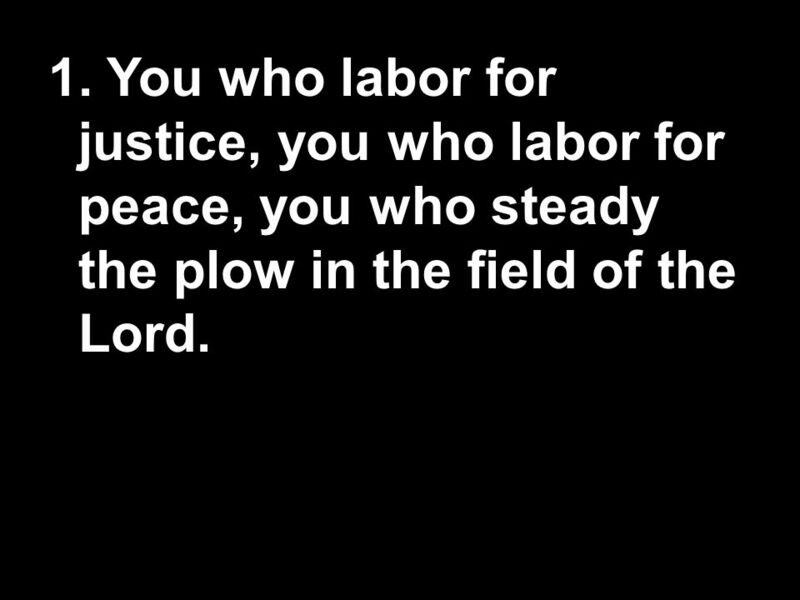 You who labor for justice, you who labor for peace, you who steady the plow in the field of the Lord. Come and be filled here at this table. Food for all who hunger and drink for all who thirst. Drink of his love, blood of salvation. You shall live forever in Jesus Christ the Lord. 4 2. You with lives full of pain, you who sorrow and weep, you beloved of Christ, come to him, come to him! 3. 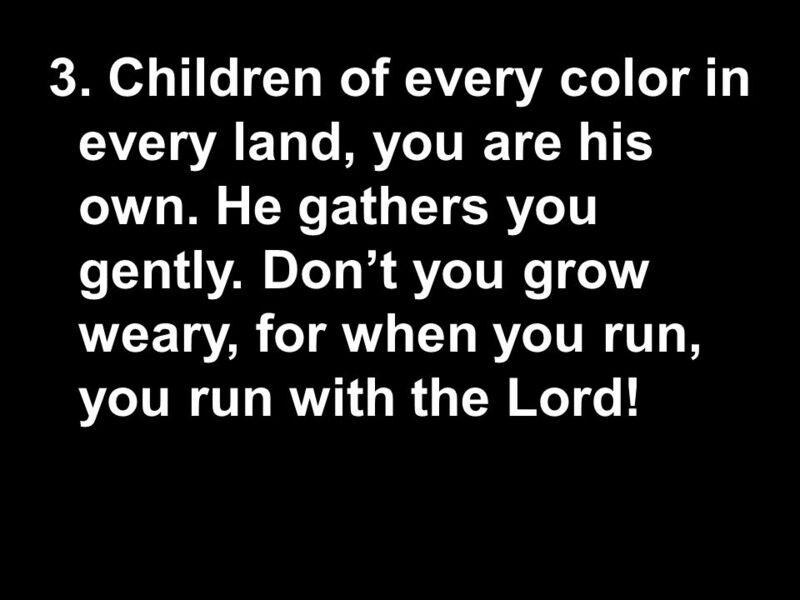 Children of every color in every land, you are his own. He gathers you gently. Don’t you grow weary, for when you run, you run with the Lord! 8 4. You, the aged among us, holy, faithful and wise may the wisdom you share form our lives and our world! 10 5. 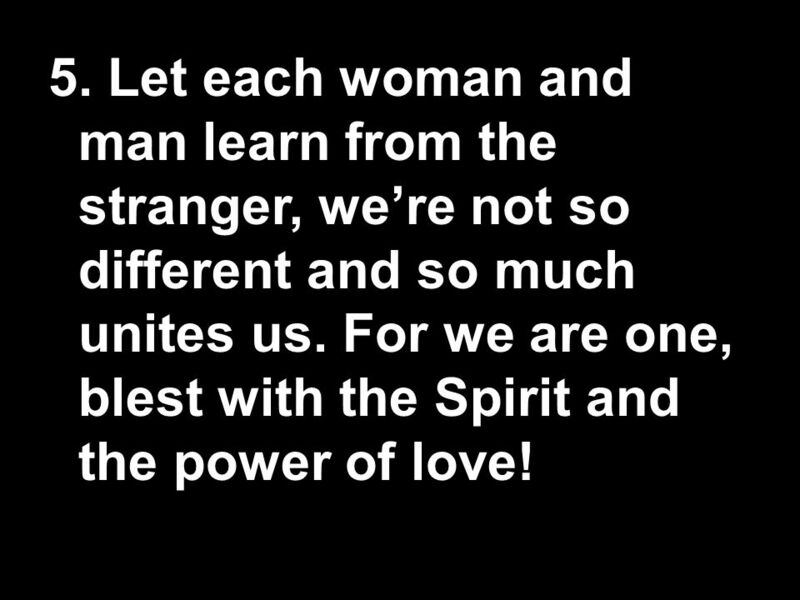 Let each woman and man learn from the stranger, we’re not so different and so much unites us. For we are one, blest with the Spirit and the power of love! Come and be filled here at this table. Food for all who hunger and drink for all who thirst. Drink of his love, blood of salvation. You shall live forever in Jesus Christ the Lord. You shall live forever in Jesus Christ the Lord. 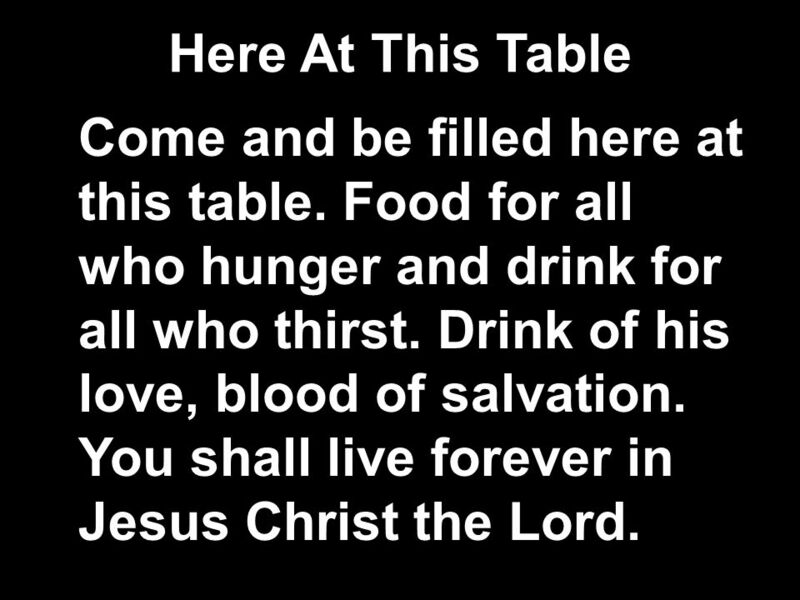 Download ppt "Here At This Table Come and be filled here at this table. 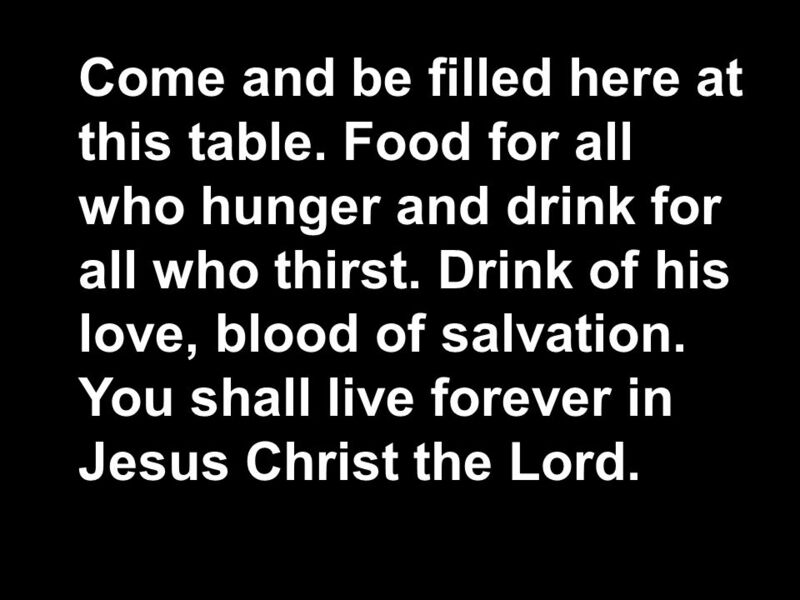 Food for all who hunger and drink for all who thirst. Drink of his love, blood of salvation." The Gospel According to Paul A faith decision has a two fold consequence… Spiritual consequences AND temporal. The Beatitudes. For theirs is the kingdom of heaven Blessed are the poor in spirit. National Lutheran Schools Week L: We come in worship to God All: In our need and bringing with us the needs of the world L: We come to God who comes. These things I write to you, though I hope to come to you shortly; but if I am delayed, I write so that you may know how you ought to conduct yourself. We can only once we are filled with Jesus love for us! Paul understood this and prayed: That you may know him better… 1 the hope to which he has called. 1 Thessalonians 5:  (Eph 3:14-21) – Paul asked the Father for…  The riches of His glory  Strengthened with His might  His Spirit in the inner. Mike Mazzalongo #2 – Genuine Conversion. Review Thessalonica 51 AD Run out of town Timothy’s report Preparing for the end. Hope. We all need Hope. Hope is available. The Hope. His name is Jesus.